This afternoon I finished reworking the shoulder strap to my first Sam Brown belt-rig. This was the one I made for the Steampunk Indiana Jones outfit - and kept re-using for several other outfits as I came up with them. A few months ago I bought a new reproduction 1911 US Army issue belt and flap-closure holster from Sportsman's Guide Catalog for any WWI, WWII, or Indiana Jones outfits. So I felt free to re-mod my original belt-rig with a longer shoulder strap that featured more accurate "dog leash" clips to hook the strap up to the belt. This is, without a doubt, the most accurate reproduction that I've done of a Sam Brown belt-rig to date. I did keep the old shoulder strap parts to re-use on another project sometime in the future. 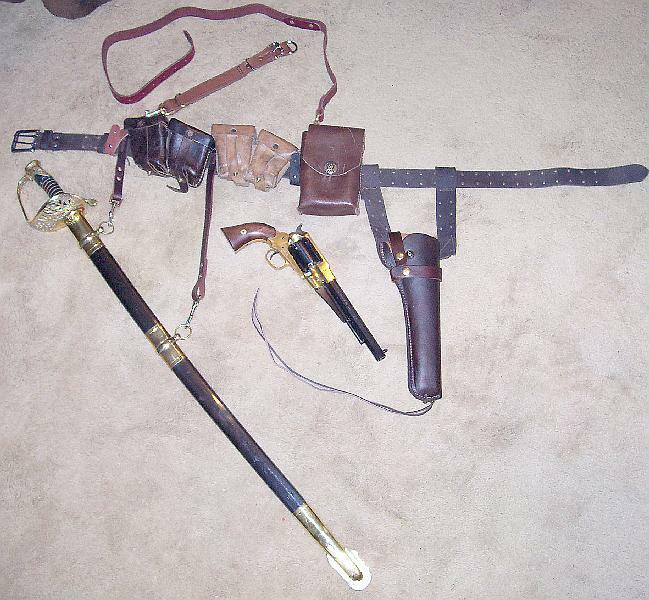 Still to be done: Getting out the leather dye and staining the shoulder strap, the tie-downs, and the light-colored ammo pouches darker, to better match the belt and holster. I'm going to wait until later to dye the new additions, because my hands hurt from pushing the awl through two bloody great thicknesses of leather on the front-piece of the shoulder strap. Two brass dog leash/horse bridle clips bought from the local hardware store. A 1&1/8th inch wide leather dog collar, bought at the hardware store. A 1&1/8th inch wide leather dog leash, bought at WalMart. Two 1/2 inch wide leather wrist bands with stud fasteners, bought from Hobby Lobby. Two 1 inch, and a single 1&1/2 inch brass D-rings, bought from Hobby Lobby. A $6 belt from the Dollar General Store. Several pouches bought from e-bay and Army Surplus stores. A holster made to fit the 1858 Remington pistol. Several scraps of another $6 Dollar General Store belt. Several bits of leather thong shoe strings bought at the grocery store. Two 1/2 inch wide dog leashes used for the sword holder straps. The materials used for just this present re-work of the shoulder strap are indicated above in bold type. An awl and a foot or two of waxed, black thread. A variable hole punch to pierce the strap so that it would buckle. A pair of small clamps to hold the leather still while I did the sewing. Dark Brown leather dye and a cotton dye swab. Step2; I threaded the large D-ring over the dog collar and then threaded the collar through one of the brass clip-fastener's swiveling end. I wanted the collar to fit so that the collar's buckle would be near the center of my chest when the job was finished. Then I sewed the fastener in place, cut the excess leather off of the collar, and sewed the remainder of the collar so that the D-ring could slide up and down roughly 5 inches between the sewed seams to whatever position I needed to catch the tail-end of the strap after it was buckled up. Step 3; I cut the hand-loop of the dog leash and threaded on the other brass clip-fastener. Then I sewed it into place using about a two inch overlap of the leather strap. That gave me the maximum length of leather to use for the shoulder strap. Step 4; I put the belt on - at the position I wanted it to fit around my hips - clipped the two bits of shoulder strap to their respective small D-rings that I'd previously fastened to the belt, and pulled the dog leash over my shoulder so that I could measure how much of the trailing end I needed to cut off. After cutting off the excess, I cut & shaped the new tongue end of the strap to look more like a factory-made belt/strap. Then I took my hole punch, selected the tip size that best matched the buckle prong on the dog collar, and made roughly a dozen holes about an inch apart up the length of the leash-end. Step 5 will be staining the newly made strap parts with the dark brown leather dye so that they better match the original belt. I don't have many close-up photos of the project. My computer's largest hard drive died last week and the replacement drive I've ordered won't be delivered until tomorrow, at the earliest. (Tomorrow also happens to be my 51st Birthday, BTW.) So I'm being conservative with what space I have left on my remaining hard drive. What few close-ups I do have are over in my Flickr pages @ Vila's Photostream. I'm not including them inside this post because A) I'm tired and I'd really rather be writing more scenes for my steampunk novel, and B) I'm sure that anyone who really wants to see those photos won't mind going to Flickr and looking at them there. I'm not really with it tonight. I spent most of yesterday night working on my steampunk novel and didn't allow myself much sleep before I got up and got started working on this project today. I'm going to crosspost this to one other steampunk community on LJ, so I apologize in advance for any extra times that you see this post. I'm happy with the way the shoulder strap turned out, even though I think I could have done better stitching if I'd gotten more sleep last night. I'm very tired right now, yet my brain won't stop formulating new scenes and dialog for my story. I'm going to go type for a while - even if I delete tonight's wordcount when I am better rested. You have fabulous stuff.I like it.